Russian model Zen Sevastyanova, after Moncler, Paris, March 2013. It is the quiet moments that I love to photograph the best. And ribbons. I love photographing a good hair ribbon. 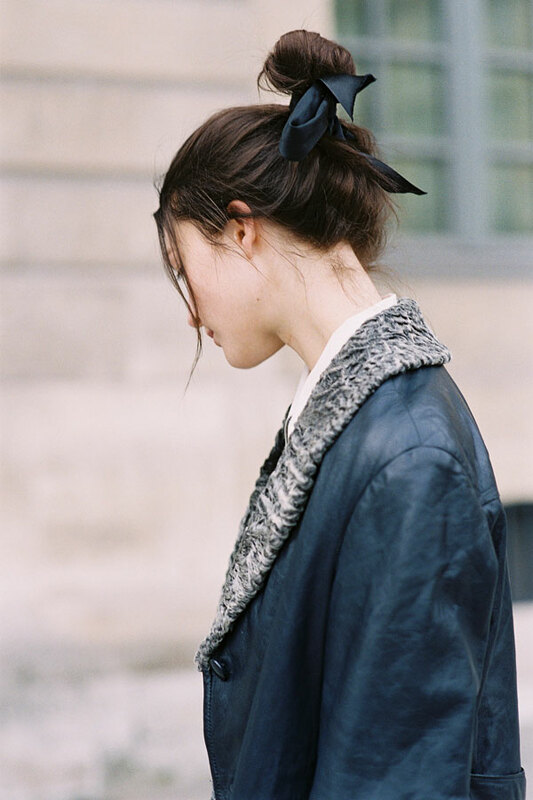 After Carven, Paris, February 2013. I think she is wearing pieces from Carven SS 2013 collection. 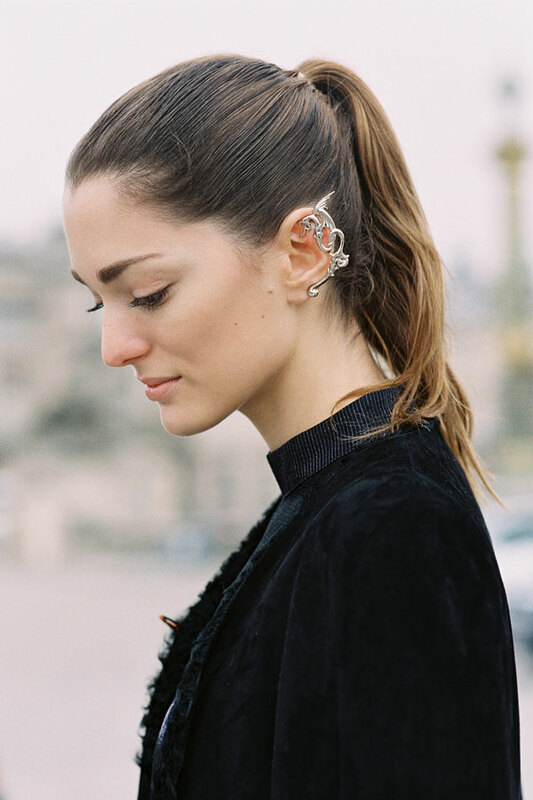 Creative director Sofia Sanchez Barrenechea, after Chloe, Paris, March 2013. Love love love Sofia's Rodarte dragon ear cuff.....so beautiful. 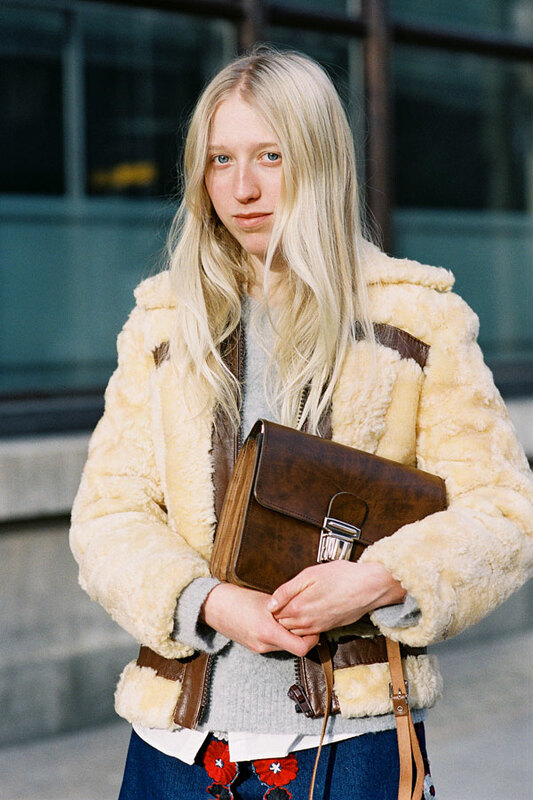 The beautiful Elin Kling of Style by Kling, after Stella McCartney, Paris, March 2013. Love this simple look on Elin (it reminds me a little of Audrey Hepburn's style).....perfect for the seasonal transition from winter into spring. After Moncler, Paris, March 2013. I love capes. They are especially good for hiding your camera under.....from rain, snow, thieves, etc. Chloe leather trimmed cape, Alice by Temperley cape, 10 Crosby Derek Lam cape, Maison Martin Margiela felt zip cape, Marni cape or Surface to Air Duffle cape coat. 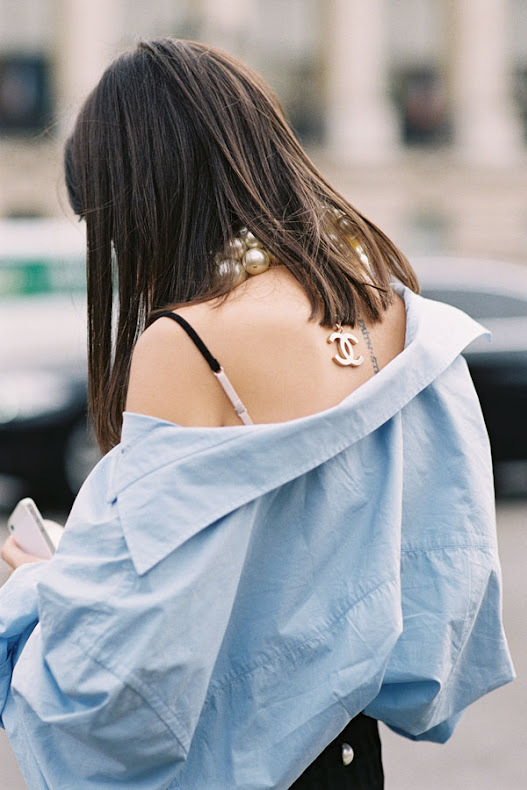 Natasha Goldenberg, after Chanel, Paris, March 2013. 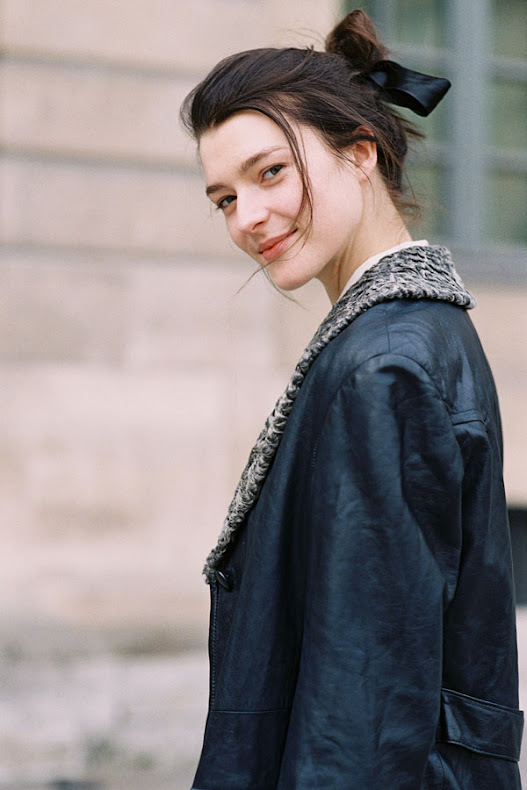 Polish model Asia Piwka, after Ann Demeulemeester, Paris, September 2012. Eva Fontanelli, Fashion Editor Elle Italia, after Ann Demeulemeester, Paris, September 2012. Sparkly top, fun print skirt (elephants in Eva's case), animal-print flats, snakeskin bag + coffee = all the ingredients to make a good day an even better one! After Ruffian, NYC, February 2013. Today was a bitterly cold day in London.....out came the gloves, beanie, heavy winter coat and scarf again! Hanneli Mustaparta, after Philosophy di Alberta Ferretti, NYC, February 2013. 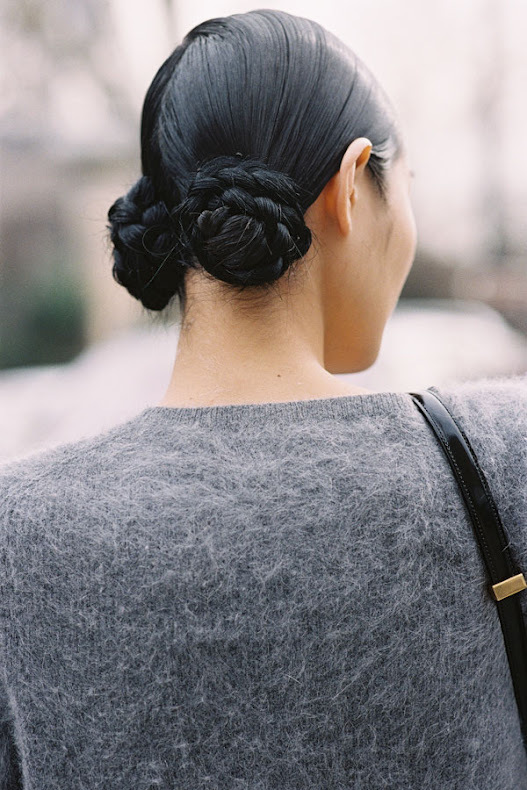 Susie Lau aka Ms Style Bubble, before Dries van Noten, Paris, September 2012. Susie's sweet rain hat came in handy later that afternoon......it absolutely poured with rain! Joanna Hillman, Style Director Harper's Bazaar US, after DKNY, NYC, February 2013. 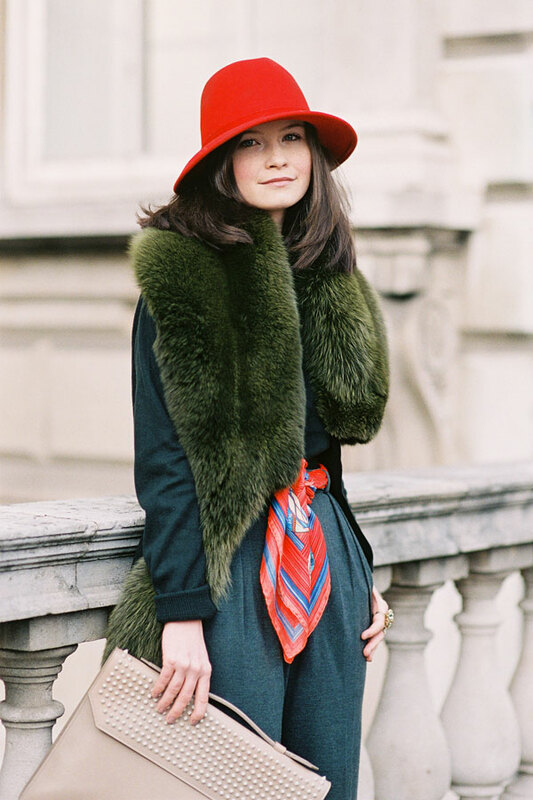 Oxana Ong, Fashion Editor Glamour Russia, after Miu Miu, Paris, March 2013. 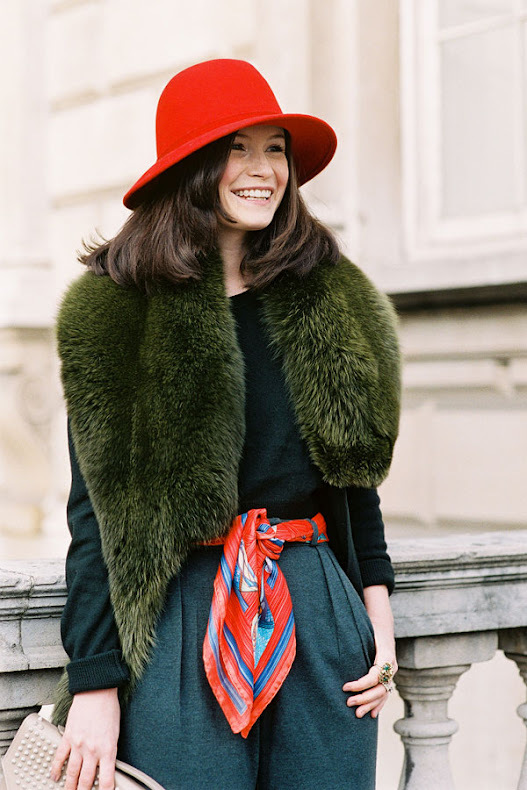 Love this pop of red on Oxana....the perfect thing to wear on a grey, cloudy day. Art and creative Director Sofia Sanchez Barrenechea, Paris, February 2013. Actress and model Alma Jodorowsky, before Chloe, Paris, October 2012. Weekend hair inspiration via Japanese model Chiharu Okunugi, after Miu Miu, Paris, March 2013. 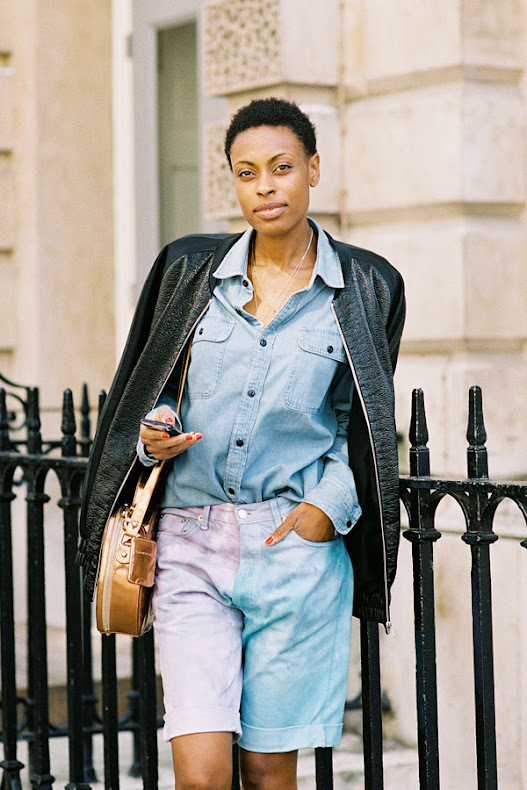 The lovely Alice, stylist and editor of Hot and Cool magazine (love. Last night was the launch party for Issue 5), London, February 2013. 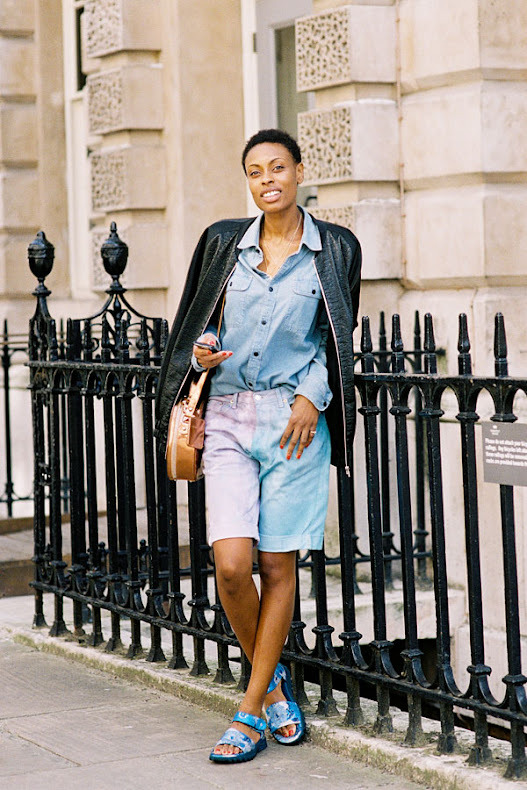 Margaret Zhang from Shine by Three blog, after Christopher Kane, London, February 2013. Swedish model Tilda Lindstam, after Valentino, Tuileries, Paris, October 2012. American model Juliana Schurig, after Peter Pilotto, London, February 2013. 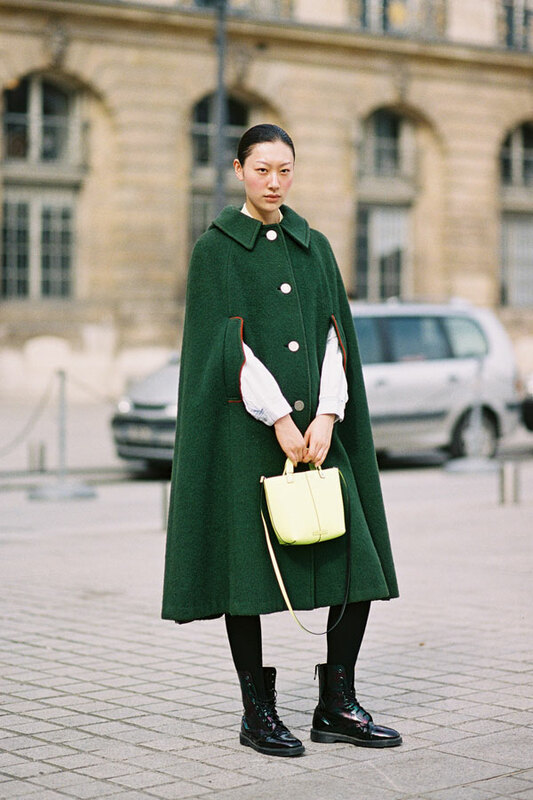 Chinese model Tian Yi, after Chloe, Paris, October 2012. 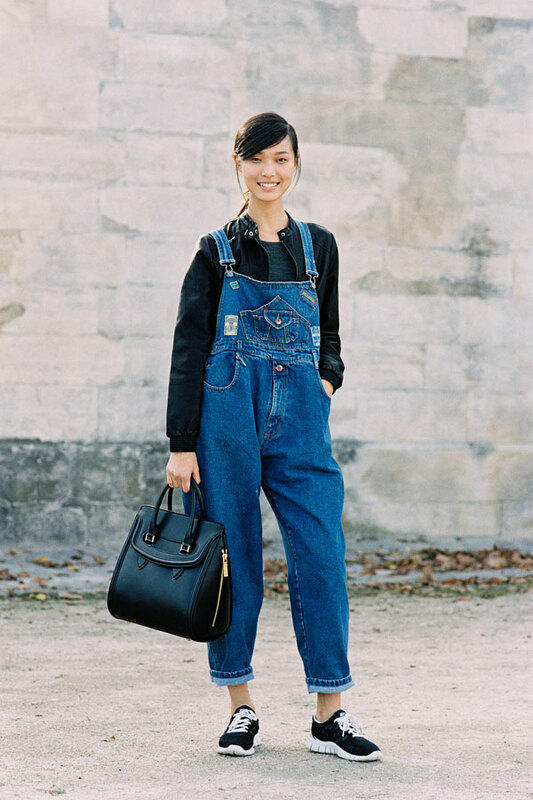 I ♥ overalls/dungarees in a very big way. Sudanese/Australian model Ajak Deng, after a show (and post- Nemo! ), NYC, February 2013. Elena Perminova, before Topshop Unique, London, February 2013. A cute print dress for Spring/Summer? Yes please. And while we are at it, could London please have some sun?! Pretty please. Peony Lim (who has a new .com home!) wearing Isolda, before Hermes, Paris, October 2012. Russian model Nastya Kusakina, after Yigal Azrouel but pre-Nemo, NYC, February 2013. 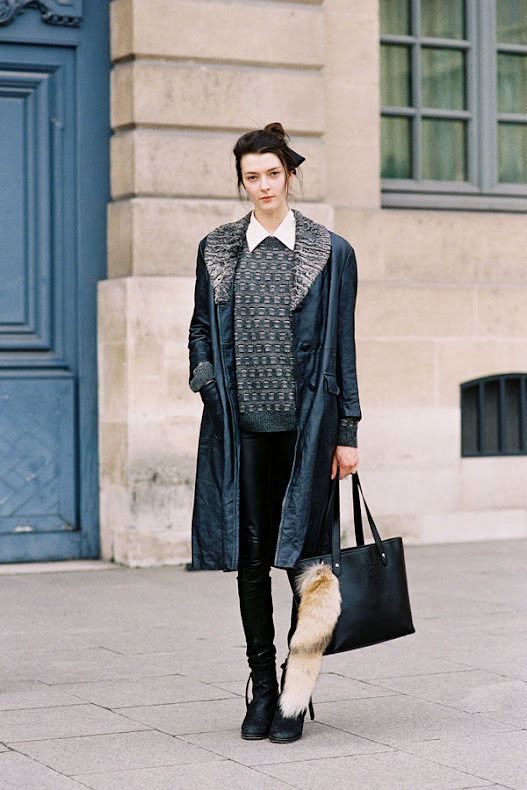 Swedish model Hedvig Palm, after Louis Vuitton, Paris, October 2012. Olivia Palermo, after Antonio Berardi, London, February 2013. 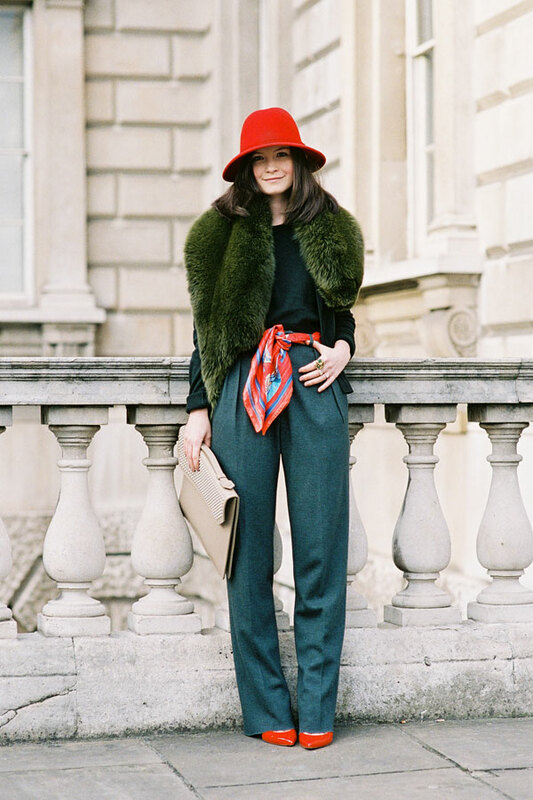 Susanah Erskine, Global Online PR manager for Christian Louboutin, Somerset House, London, February 2013. 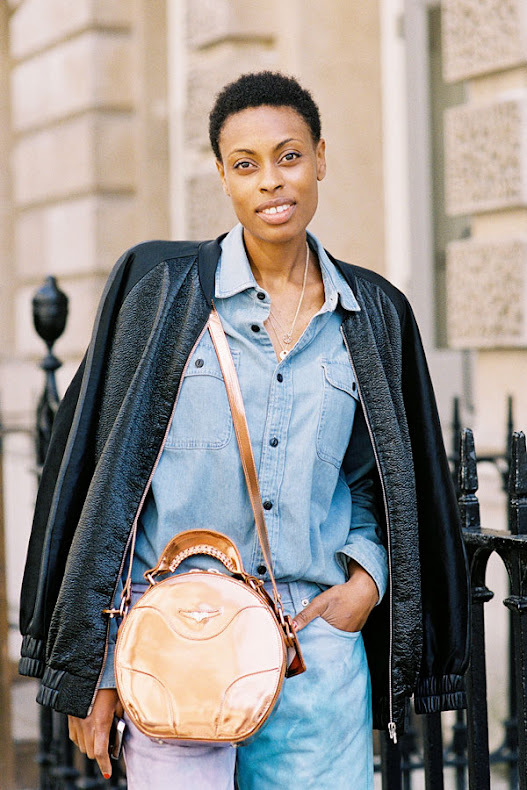 British Elle Accessories Director, Donna Wallace, Somerset House, London, September 2012.